Going back tomorrow and see if I can find the durned thing. Took Sailor back into the woods on a new trail. He’s 2yo and a real pistol. We should have worked on loose-leash walking a little more before we hit the woods where the squirrels and birds taunt and torment poor puppies who can’t help themselves if they chase after God’s tennis balls. Big sigh. On a plus note, it’s a waterproof camera. And bright red. 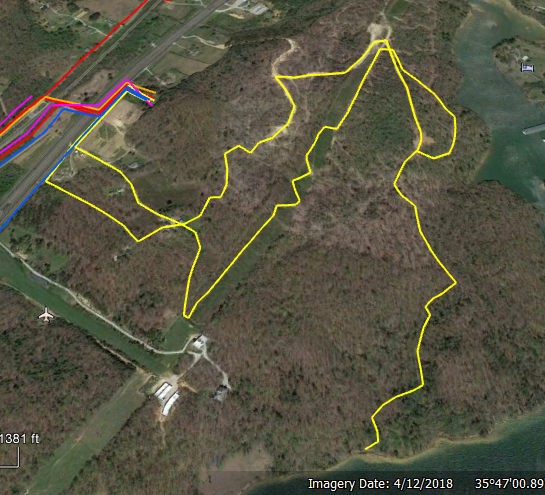 We did scout out a new 3+mile hiking trail that starts at my gate and is 100% off pavement and federal right-of-ways. Lake Trail in yellow 3.13 miles so far. When we got back it was grooming, again. Tis the season. Spent 10 minutes and long-coat Gypsy is nekkid. Ten whole minutes. This is a post-whelp blow, but it’s also because she has such a gorgeous texture to her coat — harsh and crisp, even if it’s a HUGE coat. It’s simplicity itself to get her groomed. Her pups were easier, but then they weigh less than 20#, she’s sitting at 75#. Worked some on Pax the Pirate man (11yo in August) who is doing a wierd coat blow this year, so I want to get a thyroid on him. And then raked out 10yo Trumpet (11yo in July). She has an easy-care harsh coat, a little ShowSheen (because I can’t find the Cowboy Magic after demoing it to visitors last weekend) and a grooming rake, and then she spent an uncomfortable half-hour in the elevated tub in the basement and she’s clean and wearing her summer bloomers. And soaking wet and unhappy with me. Aw, well, such is life, kiddo.